For the past few years Tauranga City Council has been gathering information about our waste problem and has come to the conclusion that something needs to change. 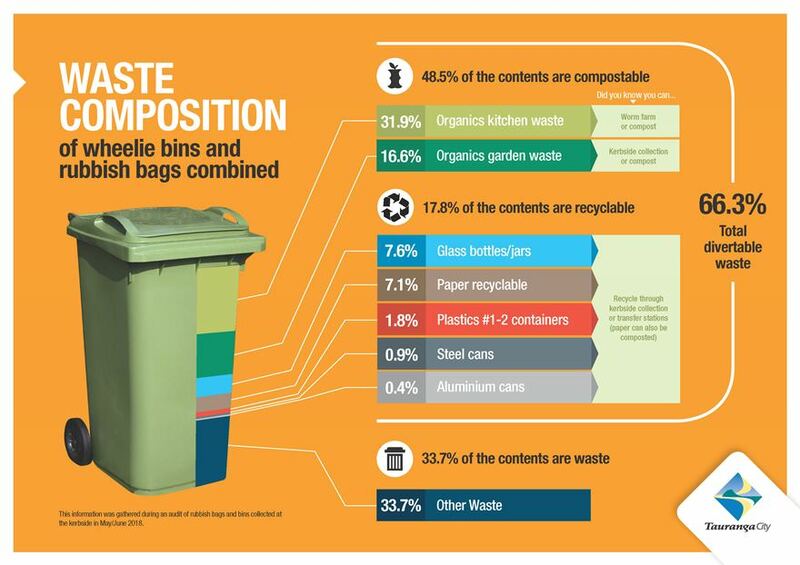 According to May/June 2018 waste audits, over 66% of the kerbside waste Tauranga sends to landfill has the potential to be recycled or composted. That’s the equivalent of throwing 417 tonnes (or about an A380 Airbus) of unnecessary waste into landfill each week. We need to do something about this. Landfills are poor long term solutions for the environment and for public health. Many of the items we throw away can be recovered and processed into new materials, saving our planet’s precious resources. Other cities around the country (and the world) are achieving much higher rates of diversion from landfill (some now even aiming for ‘Zero Waste’ to landfill) and Tauranga should aim high too. To become an internationally competitive city that provides a higher standard of living for all, we need to take more responsibility for the waste we create and its effect on our environment. Council wants to minimise our city’s waste to landfill and, according to community submissions on the 2016 Waste Management and Minimisation Plan, you want us to investigate better options for managing our waste too. One solution we’d like to introduce is a Council managed, rate-funded kerbside rubbish and recycling service that would enable and encourage all residents to recycle more and send less waste to landfill. This would also enable Council to address the current issues around the types of materials that are accepted at the kerbside for recycling, which is not currently possible with privately managed services.